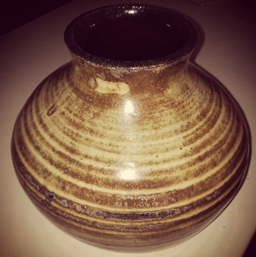 Derek has been working with clay since 2012 after taking beginning ceramics classes with Nina Saltman at sfclayworks. After about a year he started working as a Hands-up technician under the dutiful mentorship and supervision of Joyce Fujiwara. Having grown up in the southwest, Derek has always been fascinated by Native American pottery; his appreciation of southwestern aesthetics and his pragmatic outlook on life are major influences on his work. As a relatively new member of the clay community, Derek is eager to become more involved in every aspect of ceramics, from throwing to making his own glazes. 2015 update-It is always sad to say goodbye to one of our beloved hands-up members. Working closely together we develop a life long bond with one another. sfclayworks has had the pleasure of having Derek with us as a valuable member of our team for three fabulous years. We hope we helped Derek learn more about the ceramic process, and that we played an important role in the development of his skills as a ceramic artist. I am certain, as Derek moves on from the Bay area that he will seek out future opportunities to continue his passion for clay. Derek will be missed by all!